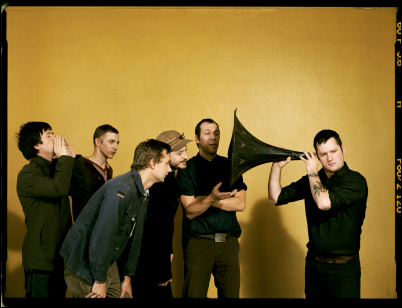 Modest Mouse is a fairly indie alternative/garage rock band that hasn't really hit the mainstream yet. They're from Seattle and they started banding together back in '93. Their most widely known songs right now are "Dashboard" and "Float On" (which is featured in Guitar Hero). Modest Mouse sounds like a mix between the Cribs, Counting Crows, the Shins, the Smiths, and the Flaming Lips. Their songs can get pretty angsty and they have the same grit to their songs that Nirvana achieved in the '90's. 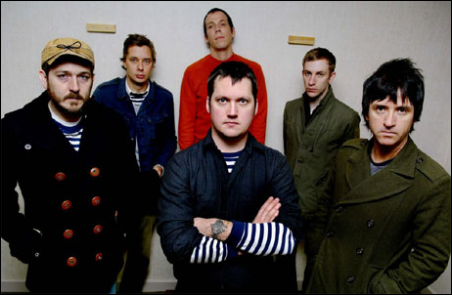 Modest Mouse was signed by Sony's Epic Records in 2000 and has since become one of the most popular indie bands to hit the mainstream (ironic, yes). Modest Mouse has sold over 3 million records, which include "This is a Long Drive for Someone with Nothing to Think About" (1996), "The Lonesome Crowded West" (1997), "The Moon & Antarctica" (2000 - this album went Gold and Platinum), "Good News for People Who Love Bad News" (2004 - this one also went Gold and Platinum), and "We Were Dead Before the Ship Even Sank" (2007). 'Nuff said. I went to the concert last night in Fargo, North Dakota at the Hub, and Modest Mouse was AWESOME! The sound quality wasn't the greatest when they first took the stage though, but that was the venue's fault. Modest Mouse started off with two heavy (as in very loud and angsty) songs that rang my eardrums solid (too loud for my liking), then they played about ten more songs that had a lighter (yet still angsty) feel to them. Modest Mouse had an eclectic sound that was made possible by a banjo, a few trumpets, a keyboard, and your basic band gear (vocalist, bass, electric and acoustic geetar [sic], and the drums). They played it up a bit, and I enjoyed the variety of their sound. When my ears couldn't take the thrashing sound of their heavier songs, I was awed by their lighter, more melodic masterpieces. Unfortunately, I missed "Float On" and "Wild Pack of Family Dogs" in Modest Mouse's encore. I had to leave right when they hit the stage for their encore because this freaky 20-something kept trying to hit on me and it was creeping me the heck out. I regret leaving and not yelling at him so I could have stayed for their encore. Otherwise, I would have given the concert a better review!